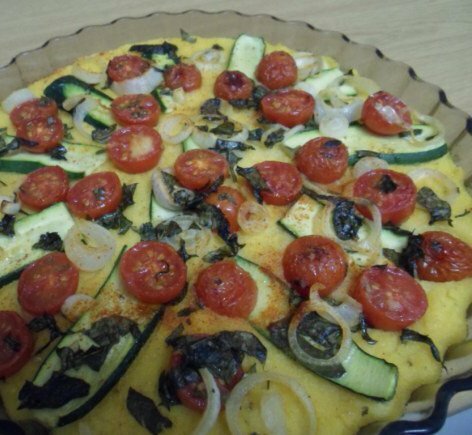 This fabulous polenta tart is packed with flavour. Beats quiche any day for a satisfying ‘light’ lunch. Preheat oven to 375º F/190º C. Grease a 9″/23 cm tart pan. In a small pot bring the water to a simmer. Slowly add in the polenta, stirring constantly until the polenta is thick — about 5 minutes. Stir in ¼ tsp salt, ¼ tsp black pepper and the chives. Pour the polenta into your tart pan and let sit for 5 minutes. Spread the sliced zucchini, tomatoes, shallots, garlic and basil over the polenta tart, making sure it is well covered. Drizzle with the olive oil and season with salt, pepper and cayenne pepper. Place in the oven and bake for 25-30 minutes or until lightly browned. Let sit for 10 minutes before slicing. Enjoy! It is a great vegan lunch idea. You can serve it hot or cold with a green salad. ← Do Animals Need a Bill of Rights?